As the labor market is subject to a number of significant changes, an ongoing process which has been set in motion many years ago, employment relationships are becoming increasingly flexible. In the Netherlands, as in many other countries, this has given rise to labor phenomena such as flex-working, part-time contracts, freelancing and self-employment. Either as a cause or an effect, this has also seen the utilization of fewer unlimited employment contracts (CBS, 2012). From the perspective of the employee this either means more flexibility and responsibility (glass is half full) or less security and stability (glass is half empty). Without wanting to get bogged down in a discussion about the desirability of this situation, I’d like to turn your attention to a potential and partial remedy for those who feel the glass is half empty. I was made aware of the Broodfonds (Broodfonds, 2014) through a friend of mine who is in the exact situation as described above; he is an entrepreneur without employees. Originating from a community style thinking that to my intuiting originates from the empowerment of niche communities through the internet, the Broodfonds brings together like-minded individuals, in this case all those in a non-traditional employment situation. In principle, the Broodfonds is a self-organized and communal insurance against a loss of wages due to sickness or disability as standard sickness insurances are unsuitable to the self employed. Since its inception in 2006, many local funds have sprung up each consisting of between 20 and 50 members. Because trust is an important factor for the survival of a Broodfonds, there is an upper limit to the number of members a fund can have to ensure that everyone can have a personal relationship to the whole community. The way in which each fund operates is dependent on the particularities of Dutch donation laws and affiliated tax exemptions. In practice, after drawing up contracts particular to the wishes of each separate community, every participant in that community sets up their own savings account. Subsequently, everyone commits to transferring a fixed and equal amount per month to the account. The money in the account remains the property of the accountholder. In case one of the participants falls ill and needs to use the Broodfonds, a small donation is taken out of each individual account and transferred to the person who needs it. The administrative side of each Broodfonds is handled and supervised by a central organization. This charitable spider in the web takes an initial fee of €275 at the initiation of the fund from each participant, but has no further claim on the savings. Upon retirement, a participant can withdraw from the fund and use his or her savings towards a pension. To analyze the structure and functioning of the Broodfonds, we can break it down into the community building blocks introduced by Malone et al. (2010). Although Malone in his analysis assumes that consumers are used by corporations to outsource some of their activities, the Broodfonds is a nice example of consumers banding together to replicate for themselves, and improve on a product traditionally offered by a company. If one replaces ‘intelligence’ with ‘money’ as the principle contribution of the participants, then it becomes clear that the Broodfonds is a highly communal effort. It is the crowd undertaking the principal effort, including taking the initial hurdle of getting the participants together, and the creation is clearly done in a collaborative style as the activity is meaningless without the (financial) weight of many individuals. Finally, as the only incentive is money, there are both group and individual decision elements. That is to say, for the inception of a single fund, each participant needs to agree to a contract that is both unique to the fund and identical for each participant, whilst at the same time each individual retains control over his or her money and has the final decision to whether stay in the community or withdraw from it. Clearly, the legal and institutional arrangements surrounding the creation of each Broodfonds are quite intricate and of course there are many more things to consider than touched upon in this brief introduction. The structure can’t be duplicated in every country without first adapting it to the peculiarities of the local tax regime. However, there are presently 2715 participants in over 80 different funds with another 25 funds under development. Self reliance as an alternative to standard sickness is proving to meet a significant need. 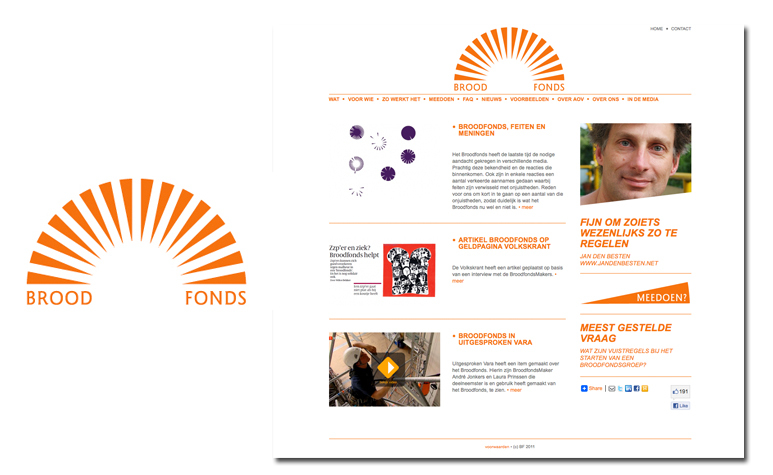 Although the concept of the Broodfonds does not depend on the internet or affiliated information technology systems, the community thinking, co-creation and reconceptualization of traditional social institutions (e.g. insurances) as displayed by the Broodfonds initiative all feel like a mindset which has at least been rejuvenated by the internet. One can compare the Broodfonds in its current for with the early stages of a crowdfunding project as distance, personal connections and trust are still a determining factor for the pooling of finances (Agrawal et al.,2011). An important question therefore becomes whether the Broodfonds might be able to build a reputation as a platform which would allow it to become a proxy for the trust the community members currently have in their personal connections. However, as we’re not talking about passion projects and cool ideas (or investment opportunities as with equity based crowdfunding) but about the financial security and livelihoods of entrepreneurs, the safeguards that need to be in place for an anonymous community would have to be even greater (Agrawal et al, 2013). Nevertheless, if the benefits of easier access to the community were to outweigh the added transaction costs and additional burden of policing potential abuses, the Broodfonds could potentially shift the employment insurance paradigm. Agrawal, A. K., Catalini, C., & Goldfarb, A. (2011). The geography of crowdfunding (No. w16820). National Bureau of Economic Research. Agrawal, A. K., Catalini, C., & Goldfarb, A. (2013). Some simple economics of crowdfunding (No. w19133). National Bureau of Economic Research. CBS, (2012). Minder werknemers met een vast contract. Accessed on April 12, 2014 via http://www.cbs.nl/nl-NL/menu/themas/arbeid-sociale-zekerheid/publicaties/artikelen/archief/2012/2012-3743-wm.htm.